Your own manor house for the day and night. You don’t have to mind the neighbours as we are surrounded by fields and cows. 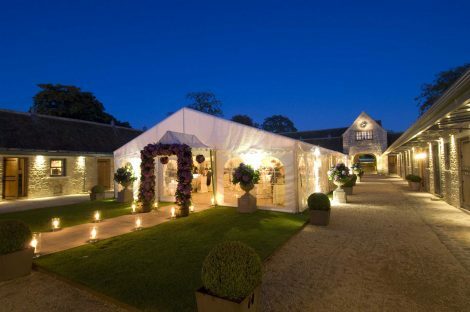 Organise a lavish dinner in the wood-paneled drawing room, host a champagne reception on the fountain terrace, enjoy a delicious barbeque in The Loggia Garden or, for 110 plus guests enjoy a marquee on one of the lawns. Whatever you decide Whatley Manor will be exclusively yours for the day! The ‘Exclusive Use’ package includes all 23 Rooms, tea and coffee making facilities in your room, a daily newspaper, use of Aquarias Spa*, exclusive use of the public areas and use of our restaurants – ‘The Dining Room’, ‘Grey’s Brasserie and ‘The Green Room’. *A limited number of Aquarias spa members will have access to the spa which has its own private entrance. Use of Aquarias Spa. Aquarias spa members will have access to the spa only with its own private entrance.